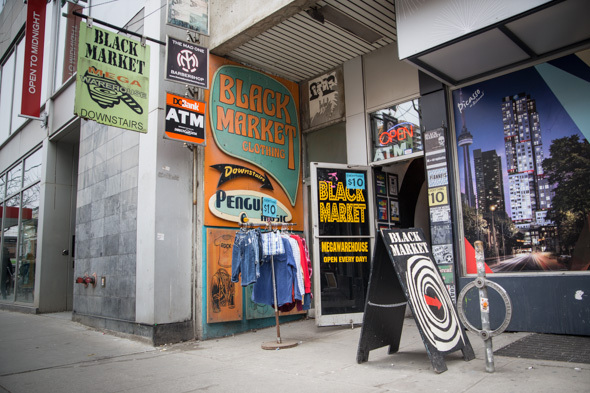 Black Market Vintage is the punk rock granddaddy of Toronto vintage stores, both in age - at 34 years young - and in sheer size. 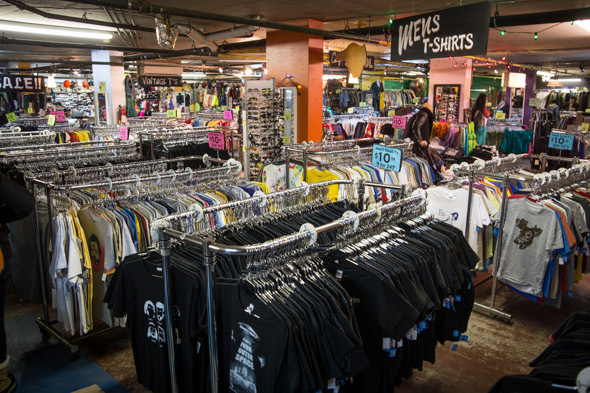 Toronto's tinsel-and-string-lights-coated temple to all things secondhand takes up roughly 7,000 densely-packed square feet in a basement space on Queen West. 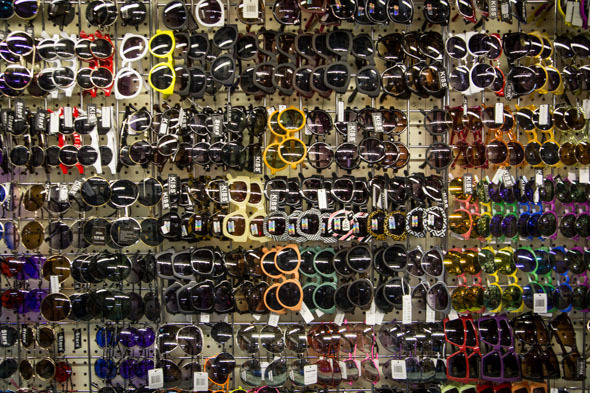 With a stock that massive, they carry something for everybody, but the Lou Reed t-shirts and '77 punk blaring over the store speakers gives Black Market a decidedly alternative flavour. 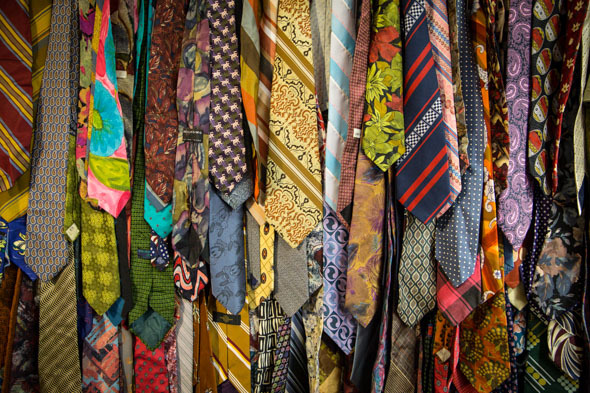 A lot of that has to do with the store's roots in the Queen West of the '80s; when Black Market was first founded in 1980, it was a series of pop-up shops, opened with the aim of putting founder John Christman through school. "Toronto wasn't as cosmopolitan back then, you know, so there wasn't a lot of choice," says Opperman, who came on board in '83. 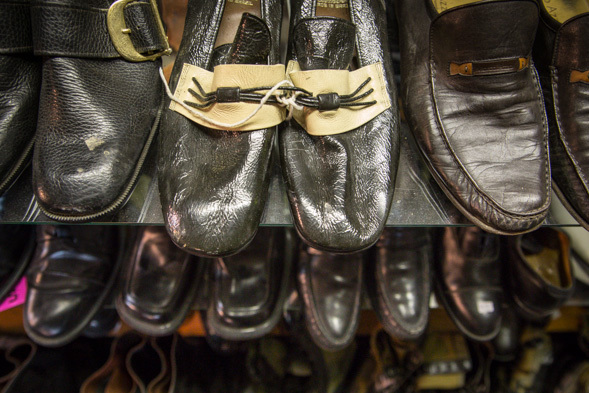 "There was maybe four or five vintage stores." Now, in the midst of a vintage boom, the store has now moved into its second generation of shoppers. 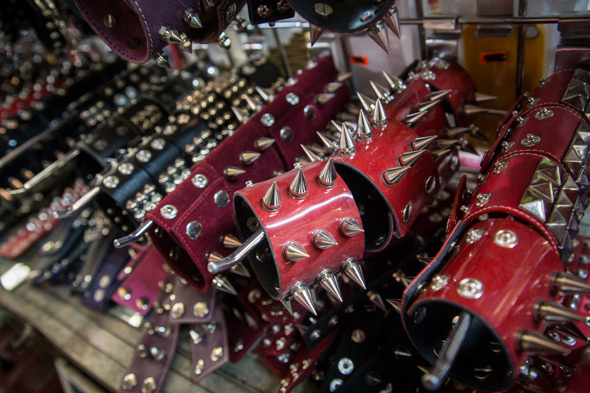 Opperman says the teens who shopped there in the '80s are now bringing in their grown kids, and on a recent visit, a horde of preteens on a field trip, ushered in by a chaperone, ran around dumping funny hats and sparkly accessories into one other's arms. Seniors living upstairs in subsidized housing stop by for $10 winter coats, while high schoolers scour the store to put together an entire prom outfit for $40. Black Market settled into its current home in 1998. "This place sat empty for years, and years, and years," Opperman says. After years of making a home out of awkward spaces, "it was one of those spots that we said 'Hmm, maybe we should figure out what we can do with that.'" In the beginning, they had a surplus of room, which they remedied by letting other stores carve out a presence in the corners of the space (making it a market in the truest sense). Modraphelia and Fairies' Pyjamas are past tenants; currently, Black Market is rounded out by Mad One Barber Shop and vinyl-only record store Good Music. "I think the same people who are going to buy our clothes will probably get a haircut at Mad One and then go to the record store and pick up some vinyl," she says. "We get people asking, but they have to be a good fit. Like, one guy wanted to sell candles. In a basement," she laughs, "that's not a good idea." Another Black Market location used to be located across the street, but shut down when the owners opened Parkdale's Public Butter , a slightly-more-upscale vintage sister store, in 2008. "We tend to send our primo, No. 1-grade stuff to Butter, so the prices are slightly higher" - that is, $20-ish to Black Market's $10. "And then if stuff sits on the shelf too long, it kind of gets graded down to here. 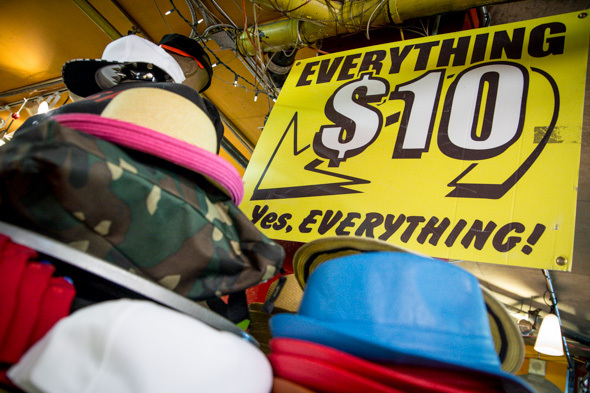 But there's so much stuff that Black Market definitely gets 90% of the best stuff." As for that $10-for-everything price point, Opperman says it was a Boxing Day sale that began four or five years ago and never ended. "It was January and February, and we were like 'Oh, let's just leave it.'" 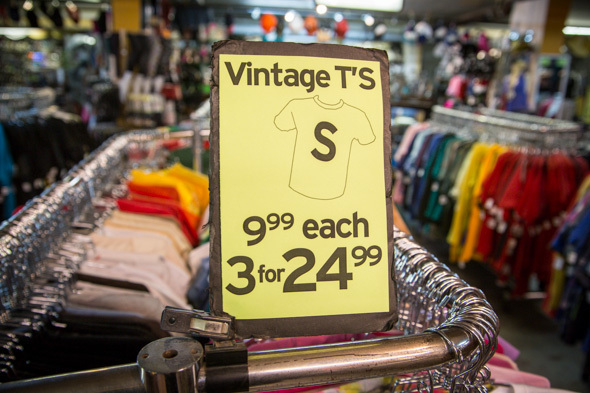 Those bargain-basement (literally) prices are part of the store's appeal. 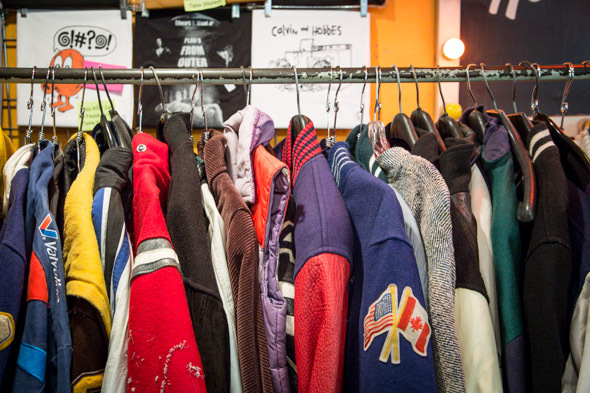 But with Black Market keeping a foothold in Queen West despite a changing environment and ever-rising rents, Opperman chalks their success up to smart moves like bringing in vintage-style pop-culture T-shirts and inexpensive new accessories. "Vintage tends to go in and out of fashion, but it keeps it fresh for us and fresh for our customers, you know, if there's always new product coming in." The neighbourhood, too, is no longer the kind of place where a fledgling store could ping-pong between empty (and inexpensive) Queen West storefronts, like Christman did in the early days. But though Opperman admits that "nothing is ever for sure when you lease on Queen," they'll stay down in the basement for as long as they can. "We've been down on this corner so long," she says. "Seen a lot of changes, but we love it down here."